Sorry for the week long delay, I was holding out hope that I might be able to get the site fixed over the week but there were some minor set backs. So instead of stalling for another week I figured I might as well push on and post another page. With the first Mission of Team Stryker I really had no script or plan going into it. I just had 1000’s of ideas stored in my mind from the many conversations my friends and I had while in school. Matt, Max and myself would just spend countless hours in the classroom or at our favorite lunch destination, The Sandwich Tree, and would talk at length about random ideas for Team Stryker. Someone would say “Deadeye should rise out of a tank of water and murder everyone in the room” and I made sure to remember each one of these ideas so that one day down the line I could finally get them on paper. Since then I have only thought of more insane ideas that I am itching to bring to life. 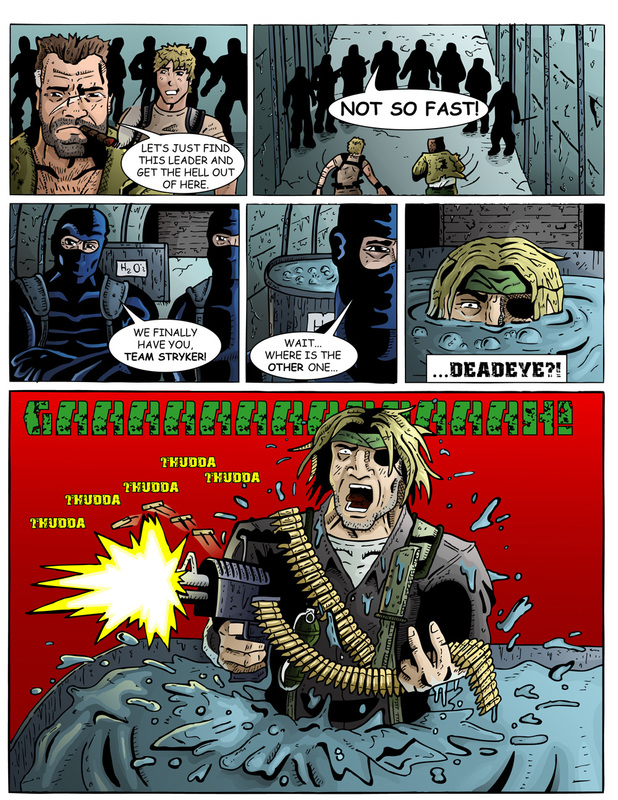 Hope everyone is having a good Monday and this page of Team Stryker helps to get you through your day. Great sequence, Andrew. Love this comic! Glad you like it! I was very inexperienced in these early days and it’s hard to look at these first few issues but we all have to start somewhere!